Should I Soak Green Bean Seeds Overnight? I planted pole beans over a week ago and they are not coming up. I dug in the rows and am finding beans. They look like they are not germinating (I hope that is the correct name). So before planting again should I soak them? It can be helpful to soak the green bean seeds overnight before planting. It will help them germinate more quickly. Before you replant your pole beans, you might wait a few more days. The ground temperature and moisture level can affect the amount of time it takes for seeds to germinate. So don't give up yet! But if they don't eventually sprout, try soaking the seeds before you replant. I planted my green beans in jiffy trays and after only 5 days the seedlings are very leggy. I understand they are reaching for the light and I have moved them to a brighter location in the house. It is still too cold to plant outdoors. Should I start over or can I plant them in pots deep; up to the seedling leaf? Green beans sprout and grow very quickly at the right temperature. Usually it is best to just wait until the soil warms up in the late spring/early summer, and plant the bean seeds directly in your garden. They will sprout and grow quickly, and be ready for harvest in 50-60 days. 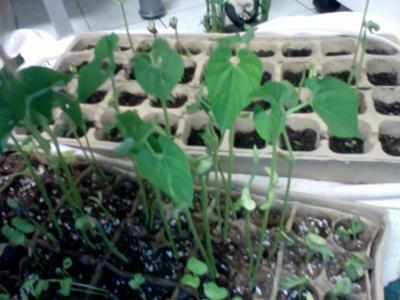 Green bean plants do not transplant very easily. They grow so quickly that it is problematic to start them indoors before planting time, as you will need to transplant them several times before it is time to plant them in the garden. You could try planting these seedlings in large containers if you have a sunny place to keep them. You really have nothing (except some potting soil!) to lose. You might get some early green beans! As long as you are experimenting, try planting some of them deep and see what happens. I have never tried this, so don't whether it will work or not. Every year my bush green bean plants fall over when they start to get mature. I plant them an inch deep, 4 - 6 inches apart. How can I overcome this problem? I don't think there is anything that you can do about this. The weight of the mature plants and the growing beans will cause this to happen. You are planting the seeds correctly; the plants are shallow-rooted and do not produce a stalk or stem that is sturdy enough to keep them upright. One advantage to growing pole beans is that they will climb a fence, trellis or teepee, and remain upright throughout the growing season. They also produce beans over a longer period of time. But you have to go to the effort of providing something for them to climb, so there is a trade-off! I want to plant beans this year; such as green beans, butter beans, and black-eyed peas. When should I plant these in the garden is southwestern Oregon, zone 8? Green beans, and other types of beans are not frost-hardy. They should be planted about 2 weeks after the last expected frost date. They also don't grow much until the soil temperature has warmed to about 55-60 degrees Fahrenheit, so there is no point in planting them too early. Some years are colder longer than other years; this year we are having a cold, wet, late spring in northern Oregon. This will make it necessary to delay planting warm-season vegetables such as beans, peppers, squash, and tomatoes for a bit longer than usual. I would check with a local garden center in Grants Pass, and ask them when most gardeners in the area plant their warm-season vegetables. For zone 8, the planting date can range from May 15th to July 1st. Usually the beginning of June is pretty safe. If an unexpected frost arrives after you have planted, it will be necessary to cover the seedlings with some fabric to protect them from getting frost-bitten. Fabric works better than plastic for this, as the plastic can transfer the cold to the plants whereas the fabric won't. My question is can green bean plants get too much water? I have rows of green beans that are mounded. Well it rained the other day and water stood about 5" deep for a long time. Some of my bean plants are wilting and dying, but the rest are ok. Yes, it is possible for green bean plants (and all other vegetable plants as well) to "drown" if they are in standing water for a period of time. Standing water, or too much water also stresses plants and makes them more prone to other types of diseases as well. That is why it is so important to have well-drained soil for your vegetable garden. One reason that raised vegetable beds are great is that they usually drain quickly if there is too much rain or if you accidentally over-water. I am a new gardener. I started some pole beans from seed two weeks ago. It is too soon to put them outside. But, they are growing very fast and need to be staked. What to do??? Thank you in advance. Green beans or pole beans are difficult to transplant. Usually it is best to just wait until the ground is warm enough to plant the bean seeds directly in your garden. You could try transplanting them into a larger container if they need more room, and putting a stake for them to climb. But if they survive, they probably won't be as productive as they would be if they were planted directly in the garden at the right time. Sorry about that. At least you tried! Can the pea plants that have been removed for thinning be transplanted? Yes they can; but peas do not transplant easily. If the roots are disturbed at all, the pea plants may not survive. Try to keep the soil intact around the roots when you dig the little plants. It's best to move them on an overcast day, or in the evening. We planted our seeds early and they are very tall now. It's too cold to put them outside yet. Any ideas of what to do with them now? I usually plant my green beans and cucumbers seeds directly in the ground at the appropriate time. You CAN transplant cucumbers, but it is very easy to disturb their roots and accidentally kill the plants. Green beans are also difficult to transplant for the same reason. You might as well try to keep them going in their pots until it is time to plant them outside. It will be difficult to transplant them into larger pots at this point, and then transplant them into the ground when the weather is warmer. Green Beans Cracking and Turning Brown- Why? I am disabled so have some mobility problems and it's hard for me to go outside. But I thought of gardening as it passes the time in a healthy way. I started the green beans indoors so I can easily care for them. I plan on transplanting them outside when they are big enough (I know transplanting vegetables can be tricky, but I want to try since I already started). I have green beans growing that I started from seedlings. They are about 6 inches high and a beautiful green. The stalk part is strong and stands upright and the leaves are great. However, where the pod part is starting there are cracks and browning in the center. I also should note I have used an organic fungicide to get rid of mold that was crowing on the cardboard pots and that was in some of the dirt. I removed what was there and everything is going away fine. But this problem of the cracking happened way before then. It looks like your green beans have developed a plant disease. It could be something that was in the soil where you planted the seeds. Or they could just be stressed from less than ideal growing conditions such as light, temperature, or humidity. For your green bean plants to be healthy and mature properly, they most likely need to be outdoors where they can get fresh air circulation, and plenty of sunshine. The soil temperature needs to be at least 60 degrees Fahrenheit before planting the seeds outdoors. If you are able, I think you will have better success if you plant some new seeds directly outdoors when the soil is warm enough. It is much easier to grow healthy green bean plants outdoors, than it is to properly control the light, temperature, humidity, etc. indoors. Every year I plant Blue Lake green beans, and order them from a reputable seed catalog, but this year I decided to support our local feed store. I planted two 15 foot rows and only about 8 beans sprouted. I never have had this problem before. Do you have any idea? How disappointing! The problem could have been the seeds themselves. If you have any of the bean seeds left, try sprouting 6 or 8 of them in wet paper towels or a paper cup and see what happens. If they don't sprout, you will know that there was a problem with the seeds. But this year I know several gardeners that had all of their green bean plants eaten by slugs or snails as soon as they sprouted. My uncle had to re-plant all of his green bean plants because of this. The bean sprouts were eaten completely and quickly! We had a mild winter followed by a lot of rain this spring, and it seemed to give the snails and slug populations a boost. Did you notice any little snail "trails" in the dirt around your green beans? This also could have been the problem. Do you have to plant multiple rows of stringbeans? Do you have to plant multiple rows of string beans and zipper peas for cross-pollination? No, it is not necessary to plant multiple rows of green beans or peas for cross-pollination to occur. Sweet corn is the vegetable that you need to be sure to plant multiple rows for pollination purposes. Will green beans shoot out again if they are broken off an inch above the ground? Unfortunately, if there are no leave remaining on the plant stem, they will not grow back. Do you have a picture of what a trellis for peas should look like? There is not one particular type of trellis that can be used for peas. You can use a section of fence, or build a simple trellis using strings and stakes. If you type "trellis for peas" in Google, and select "images" in the upper left corner of the Google page, it will bring up pictures of many different kinds of trellises for peas. Some are easier to build than others. I have planted bush peas when I didn't want to go to the bother of building a trellis. That also works! Should I be concerned in planting pole beans next to tomato plants and fruit trees as it relates to sprawling vines and depleting nutrients from the neighboring plants? Also, this is the first time I've purchase pole beans and have never planted them before. Is there a secret? Just be sure to follow the planting instructions on the back of the green bean seed packet. 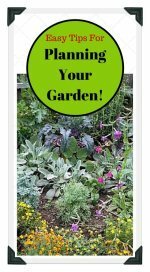 It is important to leave enough room for them to grow, and for you to have easy access to the plants for weeding, picking, etc. I don't know of any secrets for planting green beans. Again, just follow the planting instructions that come with the seeds. 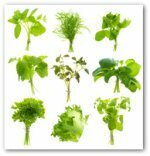 They are among the easier vegetables to grow in a home vegetable garden. Would it be ok to prepare the green beans, put them in a plastic veggie bag and place them in the refrigerator to be canned the next day? Would they lose any flavor or freshness? I think it would be fine. Green beans store quite will. If it works better for you to can them the next day, go ahead, because I don't think you would notice any difference in the flavor. Last year our peas had little white worms in the pods and they were eating the individual peas. How can we avoid this problem this year? We plan to plant our peas in another part of our yard but should we do other things? Sorry to hear about this. You are right to plant your peas in another location, as it is always good to rotate crops each year to help eliminate pest problems. It would also be a good idea to call your local county extension agent and ask if they know which pest you are dealing with. There might be a way to prevent this from occurring again by spraying the peas at the time that they are blooming. How Late in the Season Can You Plant Green Beans? I started planting my green beans in late May (in lower MI) Only one bean plant came up. In early June I replanted a few green bean plants; three or four came up but all ended up dying for one reason or another. Now it is early July can I still get a planting in? It depends on how early you can expect to have frost in your area. Green beans take about 45 to 60 days to reach maturity depending on the variety. You could try again this season if you are willing to take a chance that they will get frost-bitten before you get any green beans, or you might decide to wait for next year. What is a good variety of stringless pole beans? We have always grown the Blue Lake variety of green beans. The seeds are available in both the bush and pole varieties. I am in the Willamette Valley in Oregon. We have a mild climate here that is perfect for the Blue Lake variety. You might want to check with a local garden center to see if they recommend Blue Lake green beans for your area, as you didn't mention where you live. 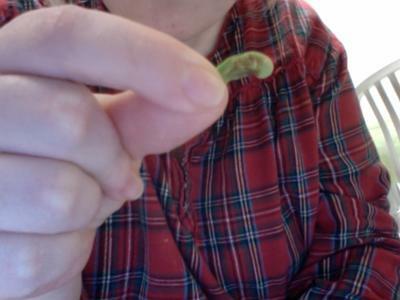 Shortly after germination something is eating off the leaves of my green bean plants, leaving just the stalk. Also leaves that have survived have holes eaten through them. What can we do to prevent this? This sounds like a slug problem. If it is possible that you have slugs in or around your garden, there is an easy organic method of treatment. You can put a shallow container on the ground near your bean plants, and fill it with beer. The slugs will be attracted to the beer, climb in, and drown! My husband and I went to the grocery store one evening, and bought the biggest, cheapest can of beer we could find to kill some slugs in our garden. As we were paying for this huge can of cheap beer, the cashier looked doubtfully at my husband and me, and said "Have a GREAT evening." When should I plant peas? I live in Zone 3 in Northern Vermont. You can plant peas as soon as you are able to work the soil in the spring. I think many gardeners plant in mid-April in your area. Cold weather isn't a problem for growing peas, as they prefer cool weather. Here in Oregon, our biggest problem with planting peas in the spring is sometimes having too much rain which results in very soggy soil! This is when having a raised bed garden for your peas can be helpful. 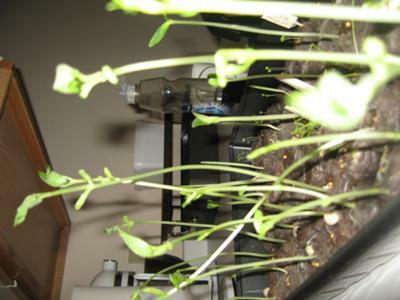 Peas need well-drained soil, or the seeds can rot and the seedlings can drown. What should the Blue Lake Pole Bean look or feel like when it is time to harvest them? I am a first time grower of any veggie. Green beans can be any size when you harvest them. Smaller slender beans are more tender. 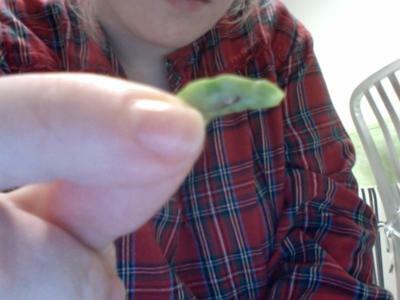 When the beans begin to look lumpy, you will notice small beans growing inside the pod. At this stage, the beans are still edible; just less tender. It is really a matter of personal preference. My mother-in-law canned pickled green beans. She cooked them with fat back just as she did fresh green beans. She died about 6 years ago, so I can't ask her for the recipe. I have been looking for a recipe for a long time now and no one has it. When I look on the internet all that I find are recipes for pickled green beans that that are served with Bloody Marys, or as a condiment just like dill pickles. If you have any resources in finding this recipe for me I would be so very grateful. Unfortunately, I don't know of a recipe for this type of pickled green beans. But if anyone reading this has a recipe for this type of pickled beans, please share it with Janie. You can click on "Click here to post comments" and share your recipe. My daughter brought home green bean seeds from school. They were wrapped in a moist towel and placed in a plastic bag. Something is now growing out of the seed but it is still in the plastic bag. Is it too late to plant it? If not, what is the best way to plant it? Any advice would be welcome because I truly do not have a green thumb. It sounds like your green bean seed has sprouted! It shouldn't be too late to plant it. If you want to grow it indoors, plant it in a paper cup or clay pot filled with potting soil. If you have a place to plant it outdoors, it will hopefully grow into a mature green bean plant and produce some beans for you to eat. Green beans grow best in full sun. If it is a climbing variety (as opposed to a bush variety) it will need a stake or trellis to climb. Place the green bean seed on top of the soil, and cover it lightly (about 1/2") with soil. Be sure to keep the soil damp, but not soggy-wet for the first week or so. After the plant has established roots, you can water it once or twice a week as needed. After growing scarlet runner beans could you tell me what crop to sow to replace the nutrients that have been depleted from the soil? Also, what nutrients should I put back into the soil to get the beans to grow again? My experience with scarlet runner beans has been using them as a cover crop to boost the nitrogen level in the soil to help the next season's plants in the garden. When rotating crops in the garden, beans are often followed by brassicas; cabbage, broccoli, cauliflower, kale, turnips. These plants feed on the nitrogen left behind by the bean plants. Since bean plants produce nitrogen, they can be fertilized with a low-nitrogen fertilizer. If you want to use a nitrogen, phosphorus, potassium (NPK) fertilizer, you could look for a formula that is lower in nitrogen, higher in phosphorus and potassium. It's a good idea to add compost to the soil each season before planting your bean crop. Some gardeners in our area of the Pacific Northwest also use a fish fertilizer on their runner beans with good results. You might want to have your soil tested to be sure that it is a fairly neutral pH. You can add lime or bone meal if your soil is acid. Runner beans like a neutral soil.